British vets are trying to determine what made this formerly cute squirrel go bald. Maybe he just wanted to be taken seriously for once. I know the feeling of not being taken seriously but i probably wouldnt try going bald! LOL! I feel for you, rat! That's sad. What's even sadder that I'm at school now. Hmph. Poor squirrel. wow. i pity the squirrel. Can't someone knit him a tailwarmer? 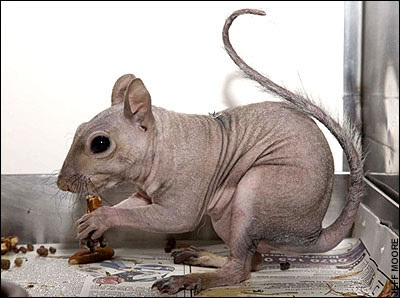 OMG that is kinda cool because where I live, more then one person has spotted a bald squirrel runnin around town. My mom would be so grossed out, she'd never let me on Ananka's Diary again. (That's what the library computers are for. Muaahahaha!) Don't worry, I'm exaggerating. But I think he's still kind of cute. HA! Squirrels ARE rats with bushy tails!